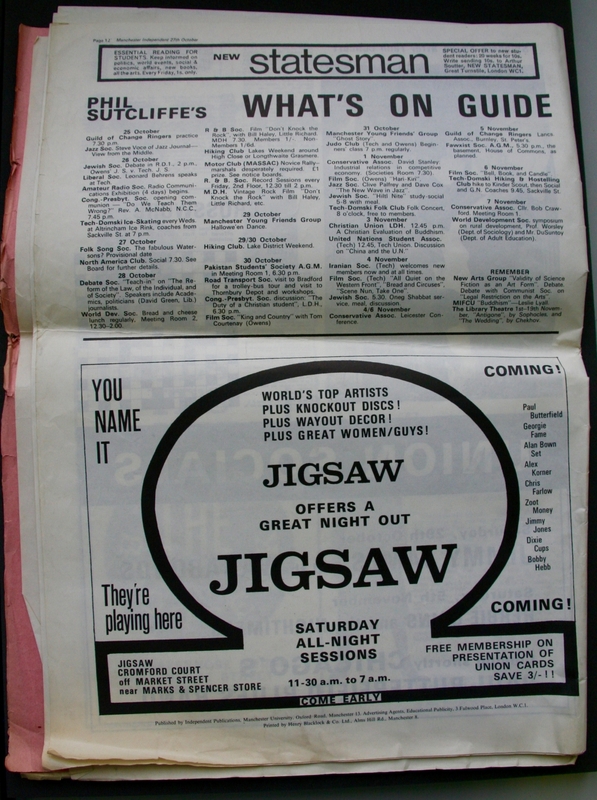 A wonderful advert for the Jigsaw, Cromford Court, off Market Street, taken from the Manchester Independent newspaper, published and edited by University of Manchester students. Members of the University of Manchester Students' Union were allowed free membership to Jigsaw. A great line-up of blues & r 'n' b acts is promised, including Georgie Fame, Alexis Korner and Chris Farlowe (spelt incorrectly). The Jigsaw hosted all-night sessions. It says here from 11.30am to 7am - I'm assuming that's another typo. The Paul Butterfiekd Blues Band! I remember! They did a double header and played the second set at The Birdcage in Ashton.